The orchid family (Orchidaceae) includes approximately 600 genera and about 30,000 natural species worldwide. Orchids thrive in U.S. Department of Agriculture plant hardiness zones 1 through 13, depending on the species, but most that are grown as houseplants are tropical species. These exotic-looking plants have earned a reputation as being difficult to grow, but many turn out to be surprisingly easy to care for. Lighting and watering needs vary, but most orchids require fertilizer high in both potassium and calcium, as well as other basic nutrients. Providing the additional nutrients required by orchids is easy and inexpensive when you use common household items. Here are several recipes for homemade orchid fertilizers. 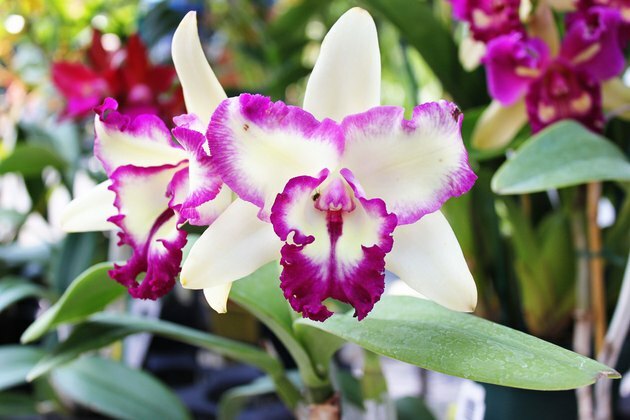 This nitrogen-rich fertilizer can be sprinkled about once a month over the orchid's soil to provide standard nutrition, as well as the extra calcium and protein needed. Thoroughly mix 2 cups cottonseed meal, 2 cups bonemeal, and 2 cups wood ashes together in a mixing bowl. Store in a sealed plastic container. To use, sprinkle 3 tablespoons onto the orchid's soil about once each month. This liquid fertilizer is another good source of nitrogen and can be used in place of regular watering once each month. Measure the leftover morning coffee from your pot (black only) and pour it into a pitcher. Add four times as much water, then stir in 1 teaspoon of apple cider vinegar. Store in a closed container, and do not refrigerate. 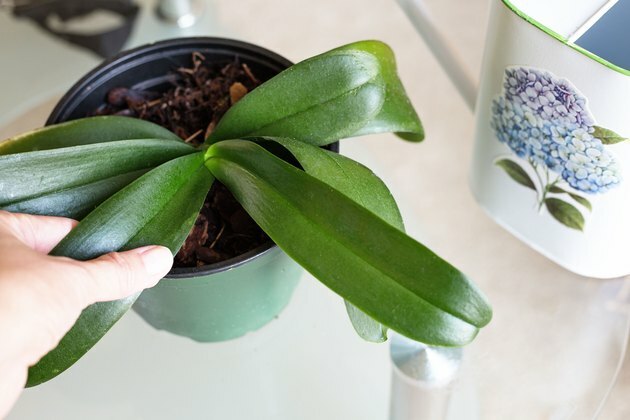 To use, water your orchid with this mixture as a replacement for regular water once each month. The mixture is especially good at rejuvenating a sluggish orchid. 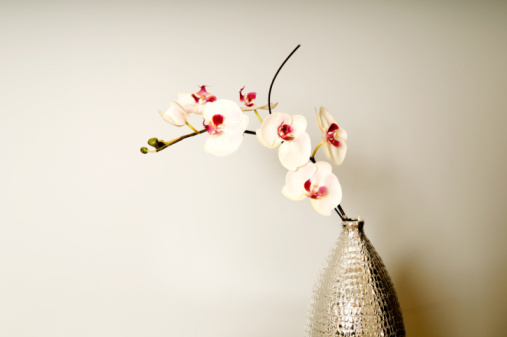 Steep crushed eggshells in water, then use the strained water to feed orchids. This homemade mixture is simply sprayed onto the foliage of orchids to provide the plants with calcium, potassium and protein. Heat 1 quart of water in a saucepan, bringing it to a boil. As the water is heating, grind 12 eggshells with a mortar and pestle. When the water boils, turn off the heat and add the eggshells. 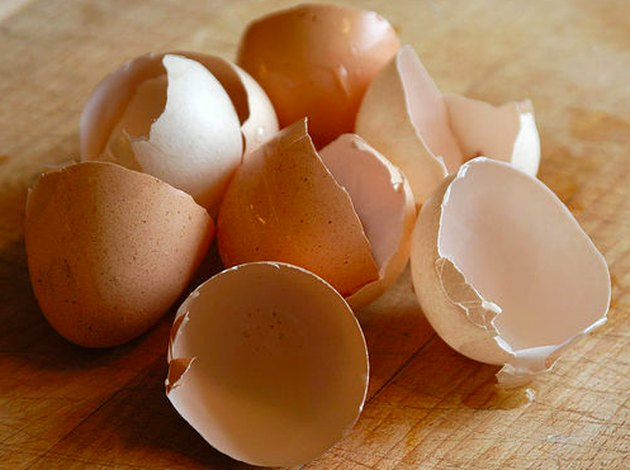 Soak the eggshells overnight in the hot water. Strain the mixture into a spray bottle. Spray orchids weekly with this mixture to add calcium, potassium and protein. Cow's milk. Ordinary cow's milk provides a good source of protein for your orchids, but it must be diluted at a ratio of 1 part milk to 4 parts water. Or get into the habit of rinsing out your empty milk carton with water and using it to water your orchids every two weeks. Molasses. Molasses gives your orchids a boost of potassium. Mix a teaspoon of molasses into a quart or 2 of water, and use it when you water your orchids. Espsom salts mixed with water makes a good orchid fertlizer. Epsom salts. Mixing a teaspoon of Epsom salts in 2 quarts of water gives your orchids a boost of magnesium. 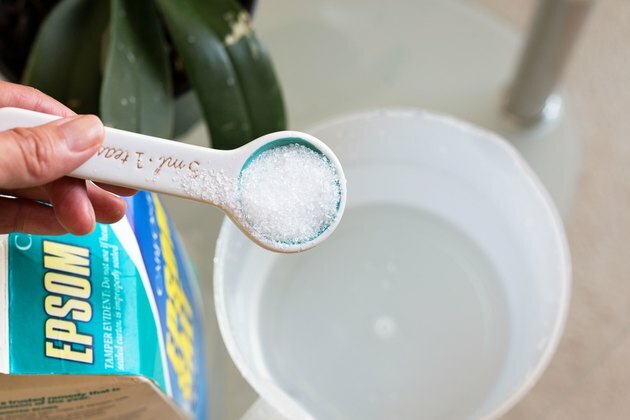 Don't use scented Epsom salts of the type sold as foot or body wash, but instead use the form sold in the gardening section of hardware and home improvement stores. Used tea granules make a good fertilizer for orchids. Oak leaves and teabags. Both of these are high in nitrogen can be used as natural fertilizer to boost orchid growth. Oak leaves need to be brewed — 1 part water to 2 parts leaves — for about two weeks in the sun to create liquid fertilizer. Water your orchids with the brewed oak-leaf tea once a month. 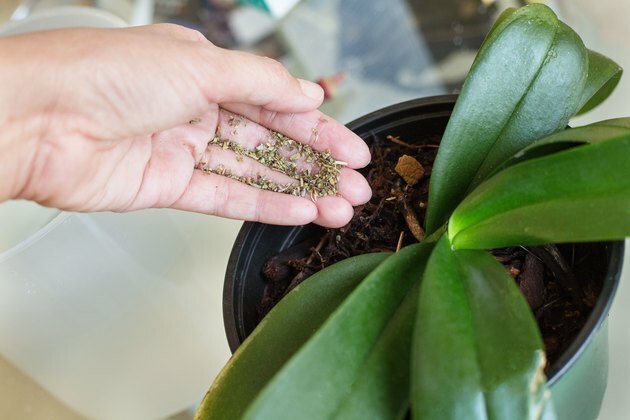 Open teabags and sprinkle the contents on the soil of your orchid plants once a month during the growing season. Potato or rice cooking water. The cooking water from both potatoes and rice provides valuable nutrients to orchids: Rice water provides a good source of vitamin B; potato water contains calcium and potassium. Save the water from cooking potatoes and rice, and store it in the refrigerator. 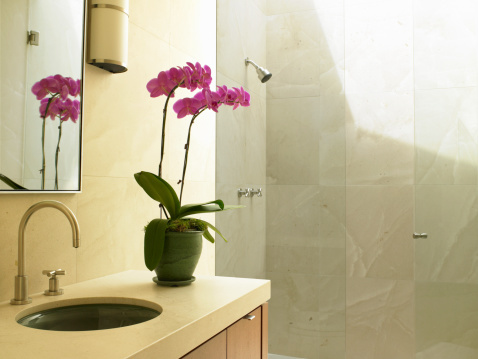 Every two weeks or so, take the water out and allow it to warm to room temperature, then apply it to the orchids. Orchids don't tolerate excessive feeding. Orchids require regular feeding, but at light doses. While homemade orchid fertilizers provide the plants the nutrients they need to thrive, be careful not to be too heavy with the application. Try one or two remedies at a time, and use the health of your orchids as your guide. Signs of overfertilization include a white crust on top of the bark, leaf tips dying and roots that turn black. Always flush your pot monthly with water to remove the buildup of salt from fertilizers. Homemade fertilizers may not give your orchid all the NPK nutrients it requires for proper health. If signs of poor health occur that are not from overfertilizing, supplement with a water-soluble 20-20-20 blend, mixed at 1 teaspoon per gallon of water, and feed the plants monthly.